Across broad areas of the environmental and social sciences, simulation models are an important way to study systems inaccessible to scientific experimental and observational methods, and also an essential complement to those more conventional approaches. The contemporary research literature is teeming with abstract simulation models whose presentation is mathematically demanding and requires a high level of knowledge of quantitative and computational methods and approaches. Furthermore, simulation models designed to represent specific systems and phenomena are often complicated, and, as a result, difficult to reconstruct from their descriptions in the literature. This book aims to provide a practical and accessible account of dynamic spatial modelling, while also equipping readers with a sound conceptual foundation in the subject, and a useful introduction to the wide-ranging literature. Spatial Simulation: Exploring Pattern and Process is organised around the idea that a small number of spatial processes underlie the wide variety of dynamic spatial models. Its central focus on three ‘building-blocks’ of dynamic spatial models – forces of attraction and segregation, individual mobile entities, and processes of spread – guides the reader to an understanding of the basis of many of the complicated models found in the research literature. The three building block models are presented in their simplest form and are progressively elaborated and related to real world process that can be represented using them. Introductory chapters cover essential background topics, particularly the relationships between pattern, process and spatiotemporal scale. Additional chapters consider how time and space can be represented in more complicated models, and methods for the analysis and evaluation of models. Finally, the three building block models are woven together in a more elaborate example to show how a complicated model can be assembled from relatively simple components. To aid understanding, more than 50 specific models described in the book are available online at patternandprocess.org for exploration in the freely available Netlogo platform. This book encourages readers to develop intuition for the abstract types of model that are likely to be appropriate for application in any specific context. Spatial Simulation: Exploring Pattern and Process will be of interest to undergraduate and graduate students taking courses in environmental, social, ecological and geographical disciplines. 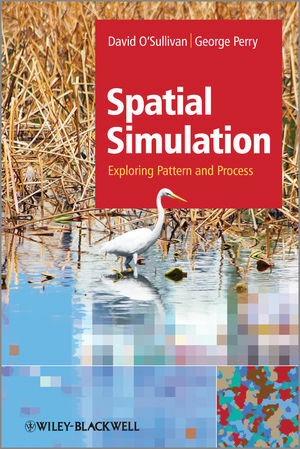 Researchers and professionals who require a non-specialist introduction will also find this book an invaluable guide to dynamic spatial simulation. DAVID O'SULLIVAN, PhD, is Assistant Professor of Geography at The Pennsylvania State University in University Park, Pennsylvania. George L.W. Perry, University of Auckland, New Zealand.